Data Is King. The Control Is In Your Hands. Included as part of your subscription is our Admin Dashboard, an online tool that lets gives you control over all aspects of your app management. From the outset we wanted the control to be in your hands. We give you a product that is ready to go from day one, but that can be easily adapted and altered as often as you need. 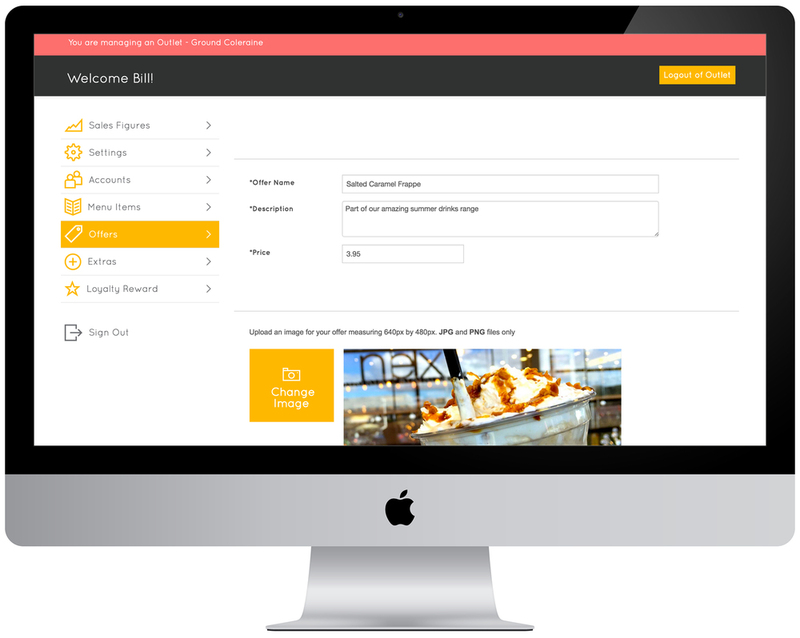 Our Dashboard software means that you can edit your menu, add new loyalty rewards, create offers for customers or view sales and customer value data. All through our user-friendly interface. Flexibility is key. Let the app run itself or analyse data, market your brand and utilise our in-app "extras" feature to increase customer spend. It's entirely up to you. Easily add or edit your menu at any time or take those popular items that sell out off the app in one click. Simply name your reward, select an icon and choose how much you want customers to spend to earn it. That's it, our software does the rest! All changes are reflected in the app instantly. Create and send offers to customers through the app. In fact, its as easy as name, price and describe. Our software automatically matches offers to the best suited customers based on purchasing habits. It's clever stuff! Our app was built for simple expansion from the ground up. Opened in a new location or simply want to run the app across your stores from day one? No problem. You can even copy menus from one location to another to save you time. Adding offer images, editing your app colour scheme, editing your menu...all of this is made easy with the Admin Dashboard.